FILE - The U.S. Navy aircraft carrier USS Carl Vinson transits the Philippine Sea, April 23, 2017. A U.S. aircraft carrier group is preparing to sail through the contested South China Sea later this month, and observers expect an angry Beijing to register its opposition and quicken its militarization of small islands in the region. A U.S. Navy statement says the group came for, “promoting freedom of the seas and enhancing regional security,” as well as working with allies in the region. That’s not the message likely to be received by Beijing, which regards about 90 percent of the 3.5 million-square-kilometer waterway as its own. “I think it’s important to show to the world that the South China Sea is an international water, that it’s not a private lake of China, and only the United States can challenge China or provide balance of power in the South China Sea,” Philippine Congressman Gary Alejano said. 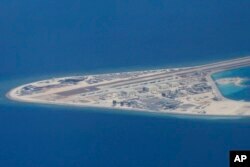 FILE - An airstrip and buildings on China's man-made Subi Reef in the Spratly chain of islands in the South China Sea are seen from a Philippine Air Force C-130, April 21, 2017. China has built up three features in the sea’s Spratly Islands since 2013 to accommodate fighter planes and radar systems, one American think tank believes. It also controls the 130-feature Paracel Islands disputed by Vietnam. The U.S. carrier group’s visit may lead China to accelerate development or deploy fighter planes, some analysts believe. U.S. maneuvers, which are taking place roughly once every two months under President Donald Trump, would spark a tightening of China’s positions in the name of “defensive purposes,” said Collin Koh, a maritime security research fellow at Nanyang Technological University in Singapore. The People’s Liberation Army Air Force has the option of basing fighter planes on the larger Spratly Islands, where all other claimant governments have nearby holdings, analysts say. 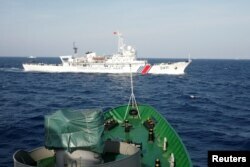 FILE - A ship (top) of the Chinese Coast Guard is seen near a vessel of the Vietnam Marine Guard, in the South China Sea, about 210 km (130 miles) off the shores of Vietnam, May 14, 2014. The USS Carl Vinson group is due to dock at Vietnam’s port in Da Nang March 5-9 following an upbeat visit to Vietnam by U.S. Defense Secretary Jim Mattis in January. The carrier will be the largest and most powerful U.S. military ship to reach a Vietnamese port, said Carl Thayer, emeritus professor with the University of New South Wales in Australia. Southeast Asian countries as well as Taiwan have been pushing for more U.S. presence as China expands at sea, backed by the world’s third strongest armed forces after the United States and Russia. “Reactions from other claimants would be in favor or that presence except China,” Huang said.